… and system Three has none. 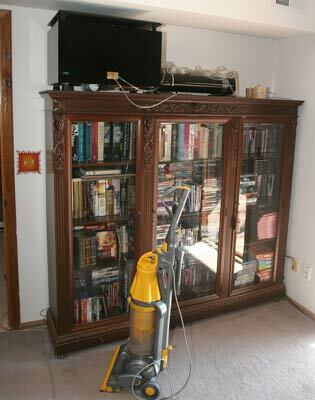 Both RixRax equipment racks are now over on the second system. 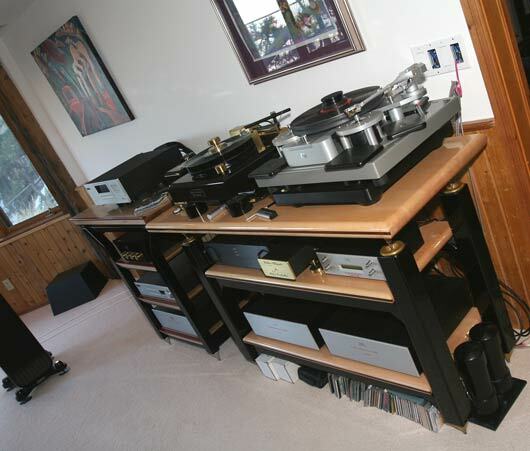 We wanted the added capability to compare two turntables, two phono stages, and the Audio Note Ongaku to the Kegon Balanced to the Kegon. 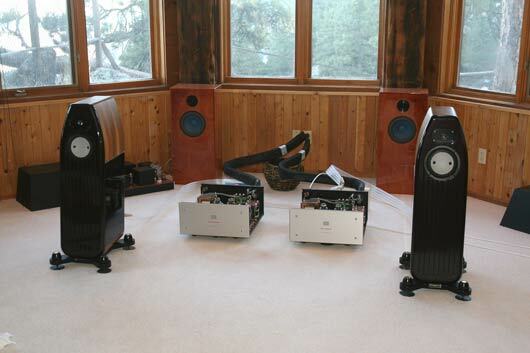 We put the Kehon Balanced amps on the Kharma Mini Exquisites. The tops have been off so we can stare at the internal electronics for awhile 🙂 But the tops will be back on soon enough… 1) they take up a lot of room just laying around, 2) the safest place for the tops of the chassis is on the chassis, and 3) just to get the aesthetic effect of a system that does not have exposed tubes. 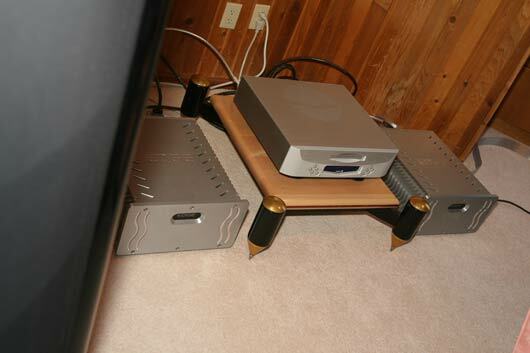 Since our Audio Note M9 Phono preamp is still to arrive, we are using the Audio Note M1 phono preamplifier to drive the Kegon Balanced. We also had the M1 on the Ongaku integrated for awhile, to get a feel for the sound of the M1 in the system that we are so very familiar with. The M1 is a very nice pre and I, personally, want to keep it here forever. At the price it sells for on Audiogon sometimes, $700, it sounds more like a $5K to 10K pre – and it always surprises me. All the low-end AN gear surprises me – I keep expecting a more discordant and harsh sound – like the low end of every other line of equipment. But nooooo, this has more harmonics and warmth than the top-of-the-line, which is more neutral and detailed and transparent and realistic. 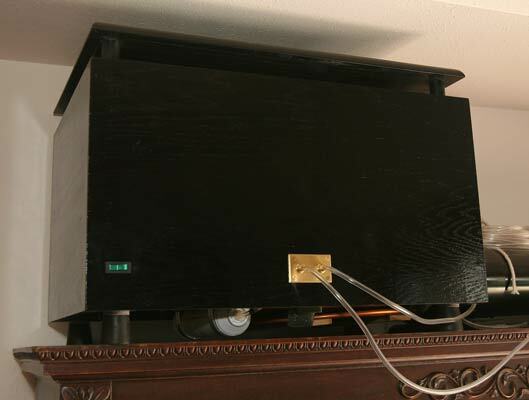 The end of the rack is now ALFULLY close to the speaker. 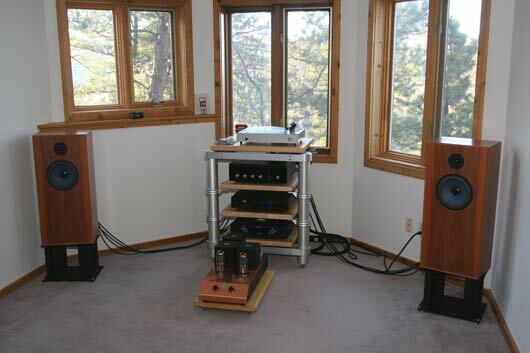 But we figure the trade-off is worth it – that we can configure some great sounding systems that we wouldn’t otherwise be able to hear. 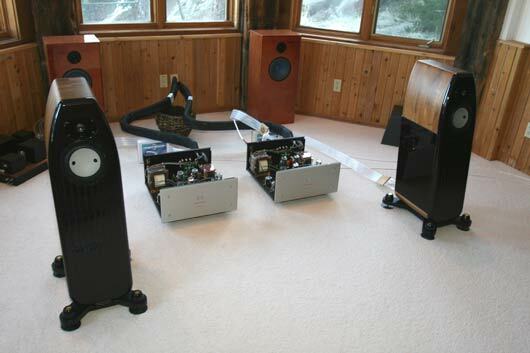 The Audio Note Kegon Balanced on the Kharma loudspeakers. 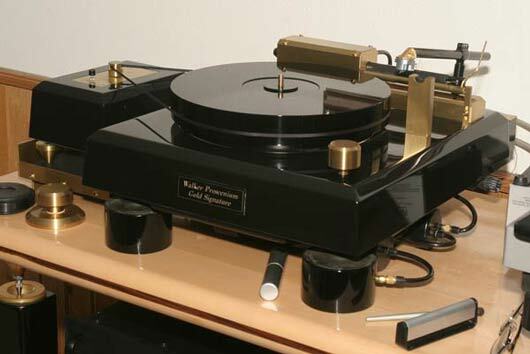 The Audio Note Kegon Balanced. 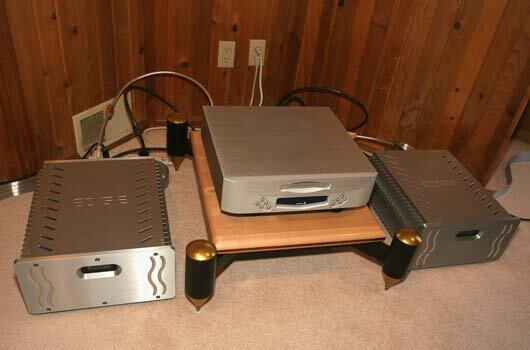 On first blush, the M1 pre + Kegon Balanced amps is very, very competitive with the Ongaku integrated amp. I would say more neutral [OK, nothing has that 211 sound except 211-based tube amps and the Kegons are 300B-based amps] and more transparent – more separation …and solidity? 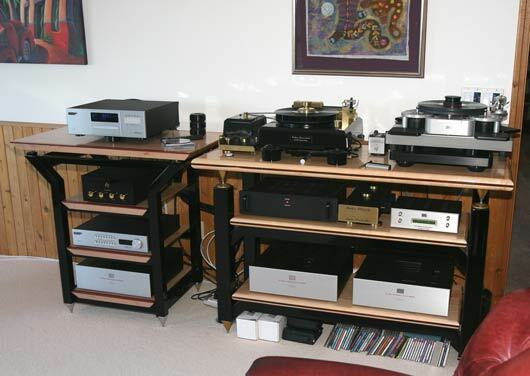 The Soundlab system without a rack looks pretty darn cool itself. 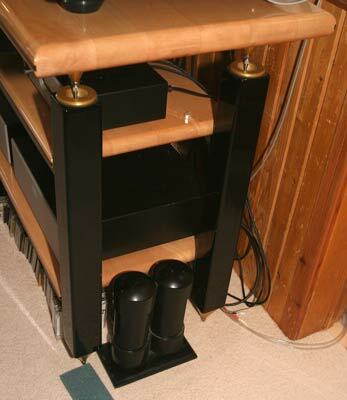 The Audio Aero Prestige is sitting on a Rix Rax amp stand. 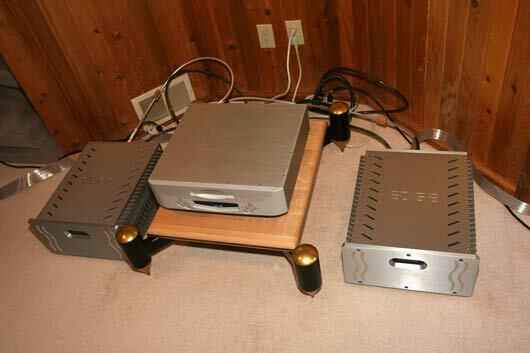 Yes, that is a Nordost ODIN between the Prestige and Edge Signature One amps. 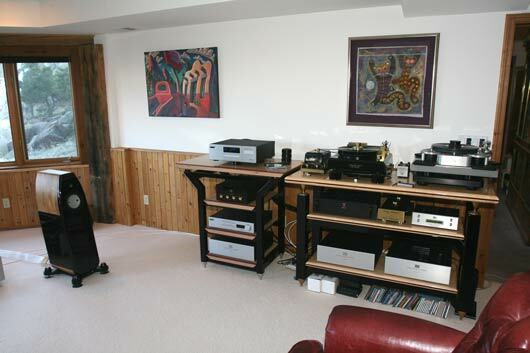 The Ongaku is now in System Four in Listening Room Three (L3). 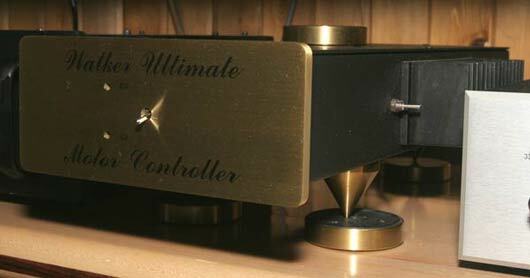 We haven’t hooked it up yet – this is still a AN Oto integrated-driven system. These are all the top performers in their particular category – more or less just like everything else we carry. There just aren’t that many of these that come on the market at demo/used prices. If you want one of these, now is the time. 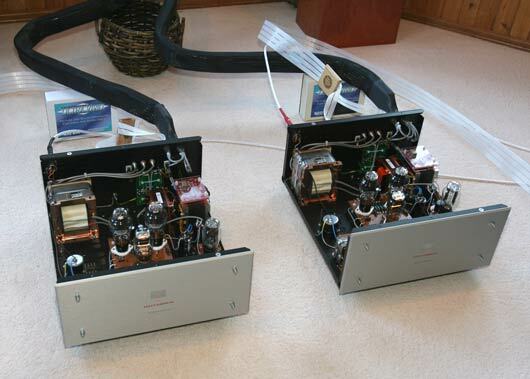 The Edge NL Reference amps are sitting waiting for a new owner. 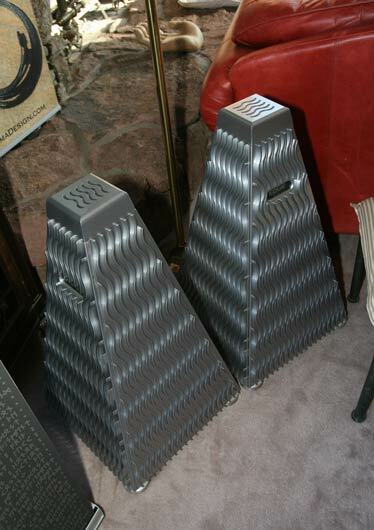 We need to make room people, the Kegons, both pairs, the Ongaku, the Lamms, … We got amps coming out of our ears…. They are up on Audiogon if you are interested. 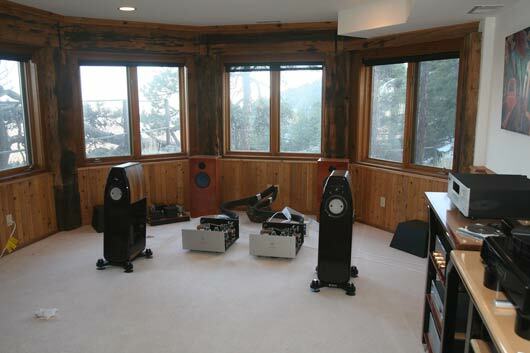 The Soundlab Ultimate 1 loudspeakers are playing music while waiting for a new owner. 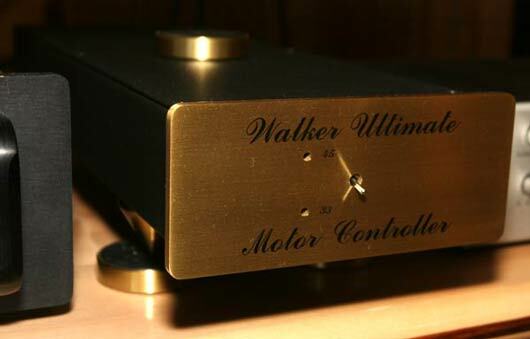 We got amps coming out our ears and speakers coming out our…. ears too. 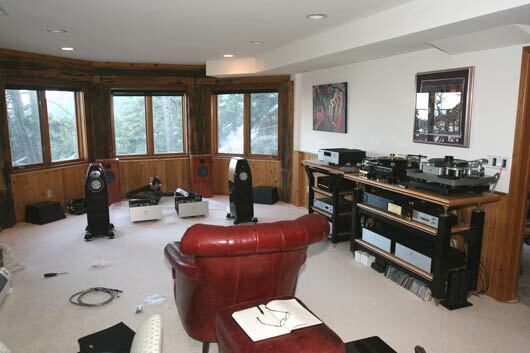 We got four systems and still we always have at least a couple of great speakers just sitting around for months on end. 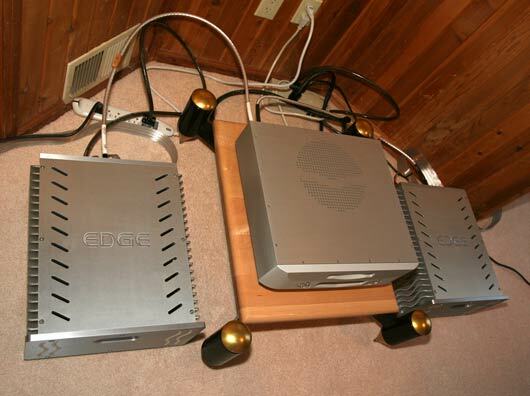 The Soundlab U1 are still the best electrostatic speakers and are up on Audiogon. 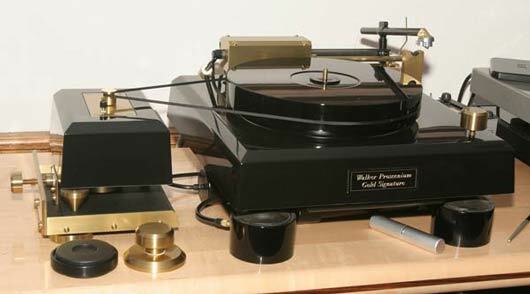 The Walker Proscenium Gold Signature turntable is ready for a new owner. Also on the infamous Audiogon. Another view of the motor controller. 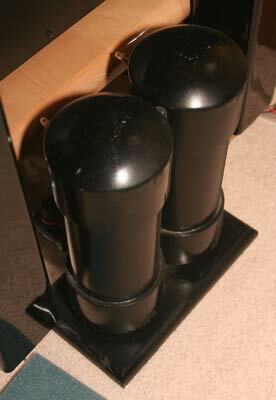 The small damping chambers sit nicely next to the rack. 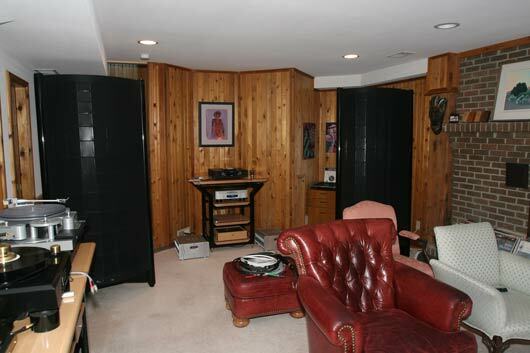 A pair of Marten Coltrane loudspeakers that we had here a long time are available – the owner is moving and is selling their entire system. It is not on Audiogon but please, if you are interested, contact us immediately.